An increase in donations and a large bequest is helping Avondale continue to invest in the student experience despite a $2 million budget deficit. The bequest, at $1.35 million, is one of the largest received by the college of higher education. It will use the money only for capital development projects that support goals identified in the strategic plan. Expenditure must be approved by College Council. Donations to Think&Do, the rebranded annual appeal, have grown year-on-year, from about $120,000 in 2008 to more than $210,000 so far in 2018 and from about $80,000 to more than $95,000 in the years Avondale does not receive an offering from local Seventh-day Adventist churches in Australia and New Zealand. The money since 2015 has supported the four research centres as they seek a better understanding of Christian education, health and lifestyle, teaching and learning and spirituality and worship. And it enabled Avondale to offer not one but three Pacific Partnership Scholarships, which provide seed money for Pacific islanders to begin postgraduate studies in lifestyle medicine. The church in the South Pacific has also given Avondale, as one of its entities, a one-off $80,000 grant to support and nurture staff wellbeing. “We’re working with our Lifestyle Research Centre, Human Resources office and other staff members to make best use of this money because we need to do better at modelling and encouraging a commitment to balance and wellbeing,” says President Professor Ray Roennfeldt. An almost $60,000 donation from a charitable trust established by a longtime Friend of Avondale will refurbish an iconic student life and learning space on the Lake Macquarie campus. College Hall, the former Chapel, will get new carpet and a contemporary study pod providing seating at tables for more than a dozen students. The pod will “provide a home and an area conducive to study for students not living on campus,” says Vice-President (Finance, Infrastructure and Risk) Kelvin Peuser. The donor, who has “a real heart for Avondale,” asked simply, “What can I do to help?”. Another donor helped by providing the balance for Avondale Conservatorium’s Refurbish A Piano project. Now with new strings and hammers, key bed bushings and extensive regulation, the Yamaha C5 Conservatory Collection Grand Piano has moved from Music Hall to Ella Hughes Chapel, where it will become an instrument for performance not just practice. 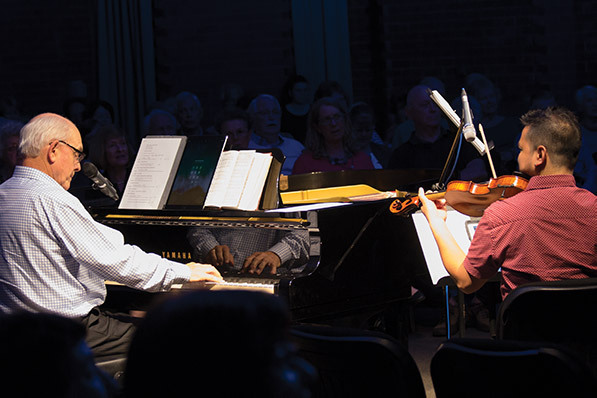 Institute of Worship Director Dr Lyell Heise played the piano during one of its first public appearances, a hymns sing for staff members and members of the community. The deficit comes as lower enrolment this year followed a near record graduation class size last year. This has meant a reduction in staffing levels with some positions remaining vacant after retirements and eight becoming redundant. Avondale needs 150 additional equivalent full-time student loads to balance the budget. It is examining the relationship between Marketing Services, Avondale Admissions and the Academic Office to convert more prospects and applicants into enrolments. It is also surveying students who enrolled, students who enrolled but withdrew before census and prospective students who did not enrol to learn more about their attitudes to Avondale. The structure and content of courses is also under review as faculty deans in particular seek to make courses more viable. Giving to Avondale through our Think&Do campaign shows your support for Christian higher education. Journey with us as we accept the challenge of learning and discovery, of educating leaders, of developing quality infrastructure, and of fostering creativity­, as we use this knowledge and these resources to improve lives. Donations over $2 are tax deductible in Australia.